Wicker Man is an excellent roller coaster in Mutiny Bay and one of the best attractions at Alton Towers. The minimum height to ride is 47 inches. Designed by Great Coasters International, the £16 million Wicker Man opened March 17, 2018 - the first wooden coaster in Great Britain in 20 years. The centerpiece is a 57-foot "Wicker Man" that bursts into flames as coaster trains run through it. This coaster is consummate proof that bigger is not necessarily better. While built on a small scale, Wicker Man provides huge entertainment. 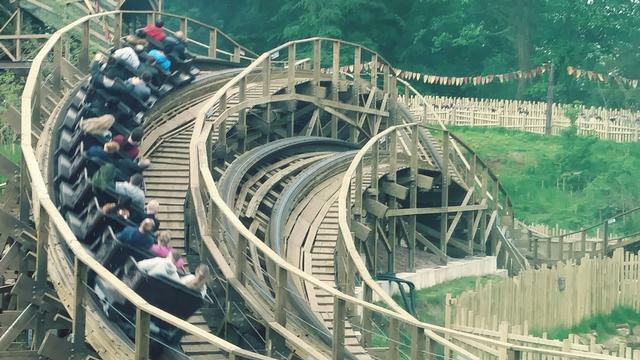 With a number of nicely banked curves, airtime hill and three passes through the Wicker Man's flaming belly, it's a lively and exciting ride. It's a coaster I could ride all day without getting bored. Wicker Man is by far the best new ride to come to Alton Towers in many years, both in terms of the rollercoaster itself and the theming and storytelling. The first thing visitors will notice as they approach is the giant Wicker Man statue, complete with real flames bursting from its shoulders. Trains fly through three times throughout the ride, seemingly in touching distance of the flame effects. Even if the queue is long, the way it weaves around and under the wooden track gives plenty of opportunities to watch the ride, and the theme music by IMAScore just adds to the immersion. Prior to the rollercoaster, guests enter a spectacular preshow which sets up the storyline for the experience they are about to have. GCI have done a great job with Wicker Man - the ride is smooth and well paced. Even though it isn't the biggest wooden rollercoaster by any stretch of the imagination, it punches well above its weight. Even though Alton Towers has been widely (and rightly) criticised for its short opening hours and bizarre operating decisions recently, Wicker Man still makes the park worth a trip. From start to finish, Wicker Man is just a phenomenal experience! Without a doubt, it is the best ride experience that has been built at Alton Towers since Nemesis in 1994! From the moment you enter the area around the ride, you are immersed in the theme. The spectacular flaming Wicker Man effigy stands imposingly at the centre of the area, and the brilliant music really helps to convey the theme. As you work your way through the queue, which itself is part of the over all experience due to the phenomenal views of the ride and the Wicker Man effigy, the atmospheric music (created specially by IMAscore) subtly changes as you get closer to the station, building excitement and anticipation for the ride. However, before you get to ride Wicker Man, there is yet another treat in store! The pre-show (created by Holovis) is absolutely fantastic! It gives riders a brief overview of the ride's storyline (and no, it's nothing to do with the films! ), but without getting bogged down in the details, and utilises some stunning special effects to really immerse riders in the story. No matter how many times you experience it, it never gets boring! Now for the ride itself. Before Wicker Man, I'd actually never ridden a wooden coaster, so yet again this was a completely new experience! And the fun begins before you even reach the lift hill, as upon exiting the station, the train plunges into a smoke filled tunnel, complete with lighting effects to make it look as though it is on fire! The ride is just amazing! It's faster and more intense than it looks, and very very smooth. There are various tunnels throughout the layout (which are also filled with smoke), as well as going through the Wicker Man a total of three times!! The ride ends by taking the train through a darkened tunnel, which again has some sound and lighting effects, before returning to the station. But the experience doesn't end there! Wicker Man has a brilliantly themed shop connected to the ride's exit, where riders can buy all kinds of merchandise, including on-ride photos! The shop is brilliantly decorated, with wicker statues, and runic letters decorating the walls. It really adds to the over all experience! Overall, this is a must do attraction! It just has something very special about it. It's just such a complete experience – every detail has been thought of. It's definitely one of the best attractions I've ever experienced!